It has been a while since I baked sourdough bread. And it is because my 4-year-old sourdough starter died suddenly. I ended up growing the sourdough starter from scratch. Then it didn’t work as I thought first time. The second time I did get an active sourdough starter. This is the first bread I made with it. I wanted to know my new starters’ ability. Sourdough bread are my weakness, hubby was asking me the other day why you are not baking rye bread. Rye is one of favorite grain I like to use it in Sourdough bread. 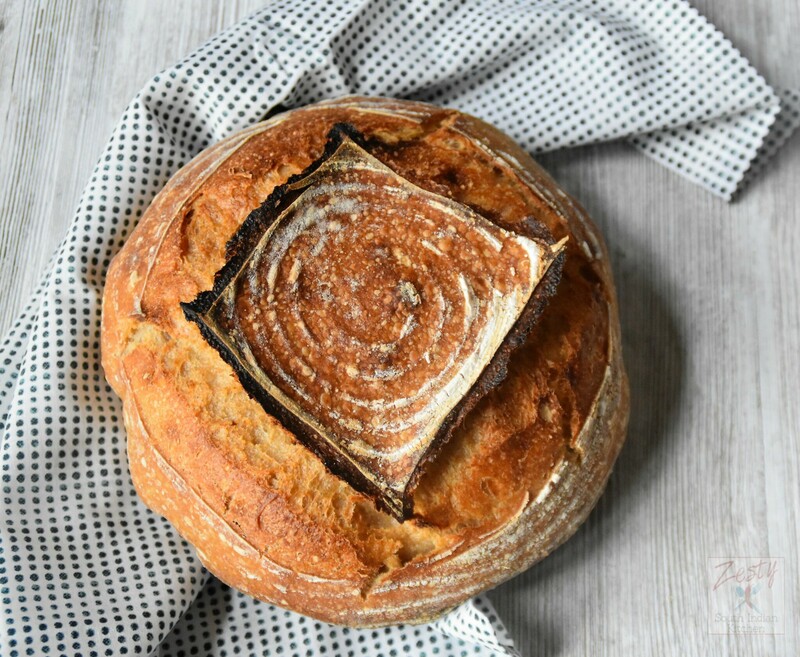 This bread is made with modified recipe form Flourish. When it comes to sourdough bread I like to use only sourdough not with instant yeast. I like instant yeast to make rich egg and butter bread. You want to experience the magic of bread making then try sourdough, it only needs flour, water and salt. Nothing else and it makes a delicious bread without any added fat. After all wild yeasts creates wonders. Make sure you feed an active starter, then make levain, and finally make bread dough. Do the first proofing then for second proofing you can do it in refrigerator overnight. Bake the bread next day. Once you have made the bread, cut the slice and dip them in olive oil or spice or even just brush with butter and enjoy. This bread has a nice tang. I used rye flour along with white flour and whole wheat flour, you can go ahead your favorite flour. If you want it entirely in whole wheat skip the white flour. Since I got back my starter I am going to make more Sourdough bread. These breads are not only delicious but also good for you. I am working on my scoring part, still struggling and learning. 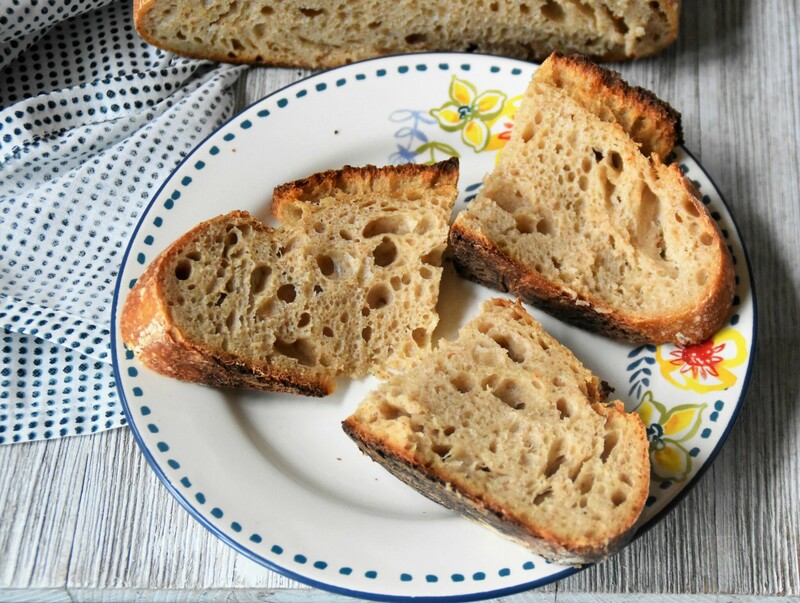 Why wait start making sourdough bread if you love a simple and tasty rye and wheat sourdough bread. Delicious rye and wheat sourdough bread goes with bowl of soup or slather with some butter or olive oil. On the day before baking mix all the ingredients in the levain and set is aside for 8 hours at room temperature. In big bowl, mix the all the ingredients for the dough except salt and leaven and mix everything well and leave it for 30 minutes. After 30 minutes mix in the salt and fold the dough for 10 times and leave it aside for another 30 minutes at room temperature. Repeat the process of folding for another two 30 minutes intervals. Prepare the proofing basket with rice flour and all purpose flour. Transfer the dough to slightly floured surface and shape it into round ball, and transfer to proofing basket. If you are baking the bread on the same day, leave it for another 3-4 hours. Or transfer the dough to the refrigerator and do a overnight cold fermentation. When you are ready to bake, preheat the oven 475F, you can preheat the oven with Dutch oven or pizza stone. If you are done overnight cold fermentation, then transfer the dough to parchment paper dusted with cornmeal. Carefully remove the lid of Dutch oven and transfer the dough, if you want you can score them. And close Dutch oven with lid and bake it for about 20 minutes. Then remove the lid and parchment paper and bake it for another 15 minutes and if the bread is not dark brown give another 5 -10 minutes. Let cool the bread for 45 minutes and then slice and enjoy. I am always looking for fun new ways to use my starter. 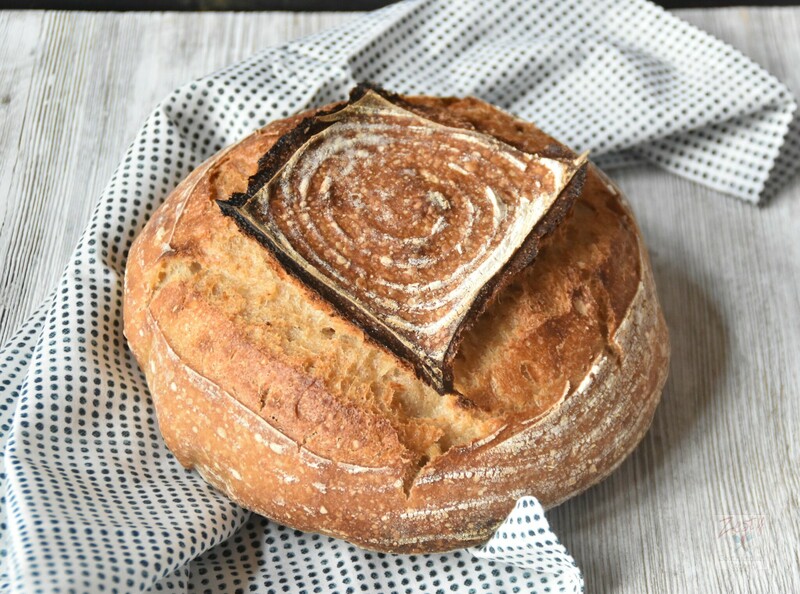 This looks like a great recipe to try and what a beautiful boule! This is one of our favorite breads. WE always use rye for making reubens. I havent made them in ages. Homemade bread would put them over the top in flavor and healthier too! I just love how yours looks it is perfect! First of all that bread is too beautiful to even cut into! We love homemade bread, but ours never looks like this! I never thought to mix all of these flavors together! Nothing is better for the soul than making homemade bread…I love the way it makes the house smell too. I would love a slice of this beautiful loaf with a pat of butter, toasted in the morning with my coffee. That to me is perfection! I have been going back and forth looking at the pictures Swathi! The bread looks out of this world and love the texture of the bread. I need to put aside my fear of sourdough and make a batch to try. Since i moved to San Francisco, sourdough bread became a staple in my house (its kinda a big deal here). But i never tried it with Rye before! mmm…this bread looks delicious!!! This is absolutely fantastic. One of my favs. I want to try a slice of this fragrant bread in the morning, with a cup of tea, or coffee. This is perfect for me. Thank you for sharing this great recipe. So YUMMY!!! I love sourdough bread but haven’t attempted making my own before. Yours look like an easy recipe to follow. I agree with you — sourdough bread is so good!! I’ve got a starter in the fridge that I’m going to have to resuscitate. I hope I can revive it. My kids always loved the sourdough bread. Have you ever added walnuts to it? It gives the bread a beautiful color. Hi, dear Swathi. I was willing to come and see this beautiful bread. Today my 6 years old sourdough has passed away, I didn’t like it. The recipe is from Eric Kayser but I’ve used it several times and I don’t like the breads I’ve baked with it. I don’t have now time, but my idea is starting with a different one. At the moment I’m using the recipe of Pataqueta and making changes and I love it. Your bread is marvellousm but you know that I think you’re the bread master.